I wasn’t always a big garden person, in fact, I was fairly sure that green fingers were not part of my lot in life. But I wasn’t willing to secede. I wanted some green in my life so I thought that I would start out safe with easy care indoor plants. Once I was sure that those would survive under my care, I experimented more. 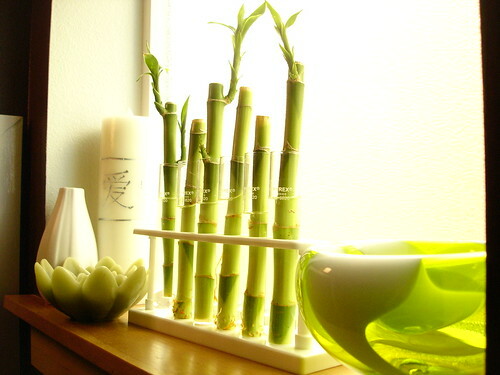 My first indoor plant was the lucky bamboo, Dracaena sanderiana. They seem to thrive with a fresh change of water weekly but I could never understand why the leave tips often burned/turned brown. I learned from the article linked below that it is the flouride in our tap water that affects them. This care guide in Organic Gardening has good information about taking care of your lucky bamboo. Thanks, Willi. The lucky bamboo pictured here are not my first. I placed these in test tubes on a rack in the half bath during the remodel last year. The first lucky bamboo plants I ever bought travelled with us across the country in the car when we moved up to Seattle, they are now growing well in my bathroom where they enjoy the humidity and light.